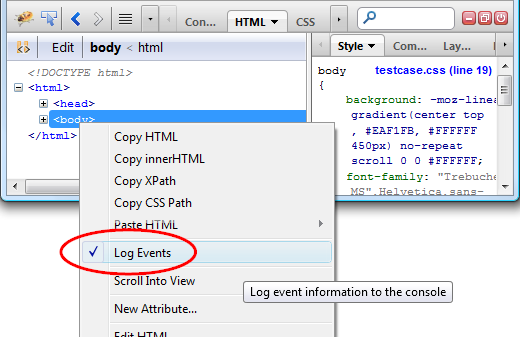 See the next screenshot, it shows a menu item that represents the Log DOM events feature. Log Events feature can be just switched on or off. There is no way to pick, which events should be logged for selected node. All events for the node are logged in the Console panel. This screenshot shows the new implementation. There is a new submenu that allows to pick what events should be actually logged. You can still click the top level Log Events menu to log all events just like before. You can also open the submenu and pick only the category of events you are interested at. There is a tooltip listing all events in the selected category. 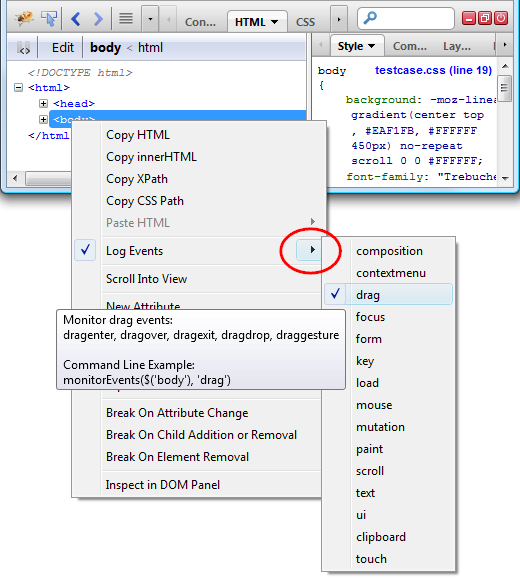 The tooltip also shows an example of how to use the feature from Firebug's command line. But, is the submenu with event-categories actually needed? Isn't the submenu too long and hard to use? Wouldn't it be simpler to keep the feature as it was before and just not log mousemove events? Is anyone actually interested in logging mousemove events? Or is there any other and better solution? keep it as the new version. I haven't had the chance of testing the alpha but I hope that you don't need to open the submenu 5 times if you want to select 5 event types. Whatever, even the submenu is a very welcome redesign. You're doing a great work. > times if you want to select 5 event types. Of course the menu stays open while selecting the different event types. That would require more clicks than the solution we have now. We generally try to avoid dialogs in favor of inline UIs. > whether a filter is applied. > You're doing a great work. Having mousemove events not checked by default would be sweet. @Skoua: I like idea, but not sure how to implement the UI/UX. The sub menu doesn't allow checking/unchecking just "mousemove" events. See the screenshot, there is only "mouse" item (event family with all mouse related events). So, how this would work? Might be useful to have a tri-state box for Select All to allow instant set all, clear all or select some. Any way the sub menu can be aligned a little higher?